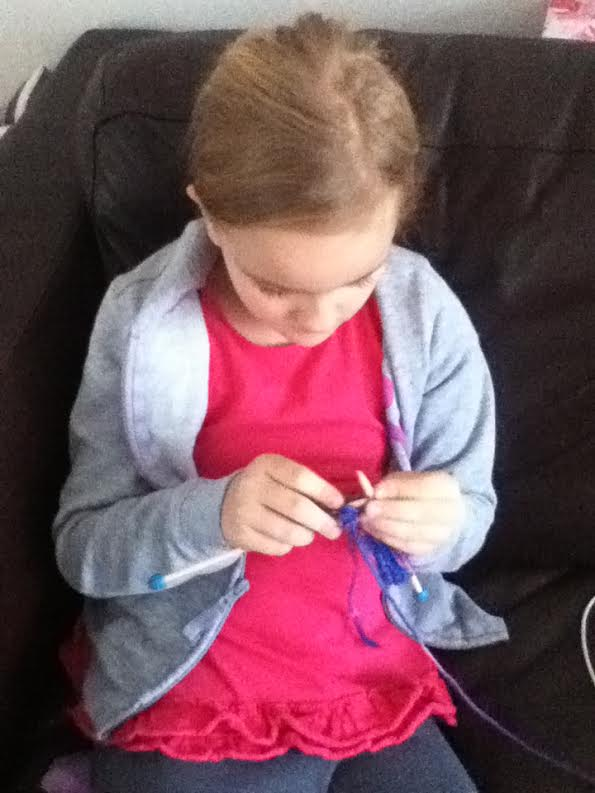 Those are just samples of the apparent deep love for knitting my daughter has discovered. Well. The love of talking about knitting. And the love of accumulating knitterly things. And having a list of projects to the moon and back. Though I do have to admit that she knits a few stitches per day, sometimes even a row on the scarf she is working on now. Now, do you know that I am also not done talking about knitting? When I knit a garment in pieces, I do not knit specific selvedge stitches, I keep the first and last stitch in stockinette – this makes seaming much easier. The reason is that selvedge stitches only get knitted every second row, and otherwise you slip them. I do find that produces holes when seaming. Picking up stitches is also much easier if you have all the rows to work with and not only half. However if you have a piece of knitting that won’t be seamed (scarf, etc.) you might want to use a selvedge stitch. When working a selvedge stitch starting with a knit stitch, you want to slip it knit wise with yarn in back (see, we’re kind of picking up where I left off) and work to the end of the row. If you slip this one purl wise it will be loose and does not look good, in short: it really does not do what it is supposed to do. So make sure you slip it knit wise. If the first stitch is a purl stitch, you want to slip the stitch purl wise with yarn in front and then do whatever you do to the end of the row. I am not saying it is impossible to slip this one knit wise, but it sort of works against the knitting when you try to do that. I hope this helps with cleaning up your edges – when you feel like it. I learned this decades ago as ” Slip the last stitch purl wise and knit into the back of the first stitch”. I’ve tried slipping the first stitch but find it less comfortable to execute than knitting into the back. Perhaps it’s just become a habit. Seems to work well for me. Love the blog! that is SO adorable. 😀 i mean about H knitting, not the seaming; seaming is hardly ever adorable. 😉 good tips, however. totally agree about the slipped sts for seamed edges. I have to knit in round but my last stitch before the first round is a slip stitch. When I knit the first stitch at the beginning of the round, there’s always a long yarn in the joint and I don’t know how to do it. I mean to don’t have this loose. Anyone have an idea? ?